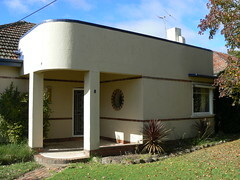 This sweet little deco house is in the Victorian town of Ararat. I really like the porthole window near the door. It is framed in the same bricks that have been used in the two lines that run around the entire front of the house. 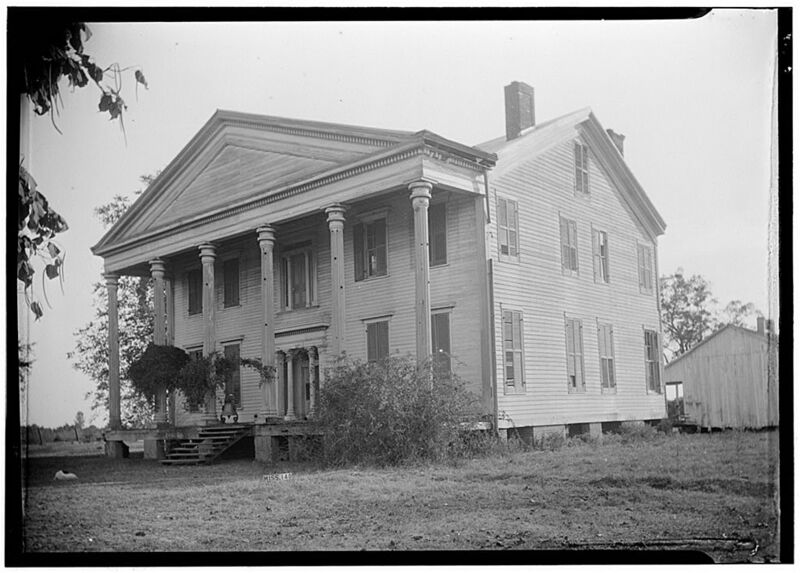 It is difficult to see in the top photo but the corners of the house are curved and the windows cut across them to creating an interesting effect. I also like the small eyebrow above the window on the right hand side of the house. 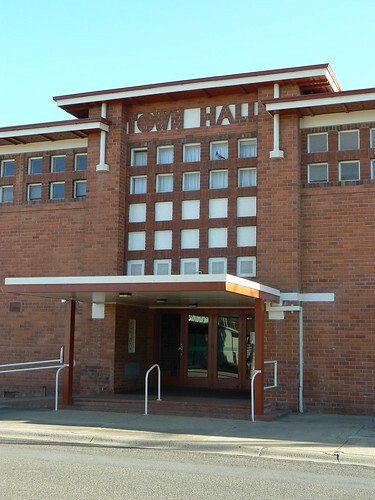 The Town Hall in Numurkah was designed by Melbourne architects A C Leith & Bartlett. 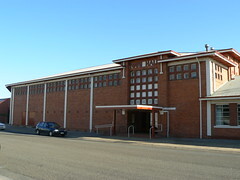 It was constructed in 1938 by builder L L Bode of Seymour. The artical also talks of a planned projection room with 'the equipment mounted on special swivel gear' to allow screenings in the auditorium or an open-air theatre at the rear of the building. I wonder if the projection room was installed. 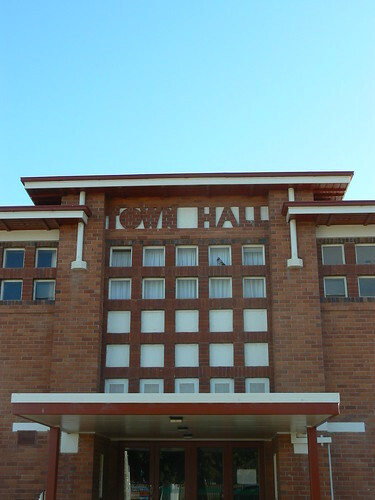 It isn't mentioned in the Argus article when the Town Hall was offically opened on 16th November 1938 by then neither is the brick decoration spelling out the words 'TOWN HALL' above the door. 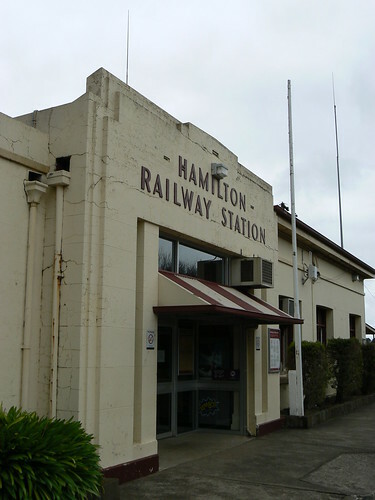 The railway came to Hamilton in the 1870s long before the Art Deco period but obviously something happened in that interwar period and they built a new entrance to the station. Perhaps they built a whole new facade. 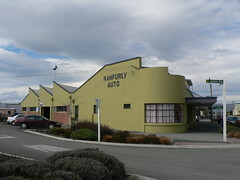 When I explored around the corner of the building, the side was constructed from weatherboard so perhaps a new concrete or rendered front was put onto the old wooden station. 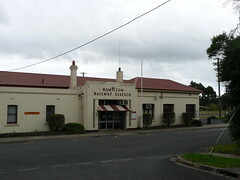 The trains no longer stop at Hamilton but the large station building is used for buses and coaches. 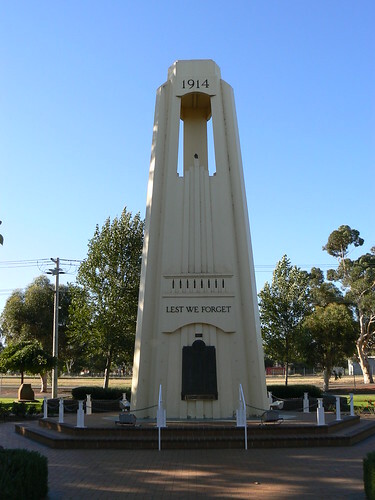 Seventy-one years ago today, the cenotaph in Griffith, NSW was dedicated. It is no accident that the days coincide. Anzac Day, 25th April, is one of the most observed days in Australia. As the numbers of actual veterans of war have declined over the years I think the commemoration of those killed during conflict has become stronger. The waste of life on all sides has come into sharper focus and while we honour their memory, their are possibly moe people opposed to war today than at any point in our history. 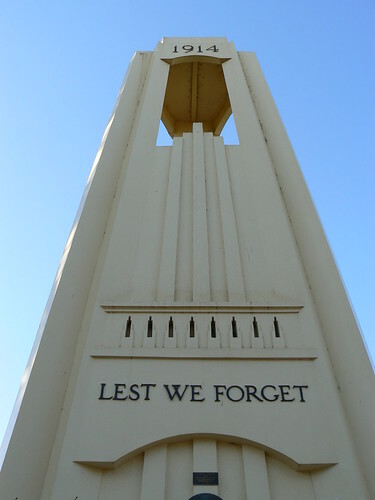 So, on 25th April 1940, the cenotaph in Griffith was dedicated to 'our glorious dead' from WWI. Additional plaques have been added for those who 'made the supreme sacrifice'. The Register of War Memorials in New South Wales says 'pencil perspective drawings were done by Arthur Buckley Long with Allan Brayne doing the dimensions and working drawings'. I think you'll agree they designed an impressive and fitting memorial. 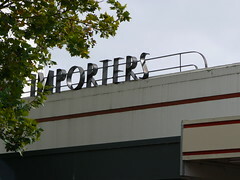 This impressive metal lettering spelling out the word IMPORTERS belongs to, what is now, the Target Country store in Gray Street, Hamilton. 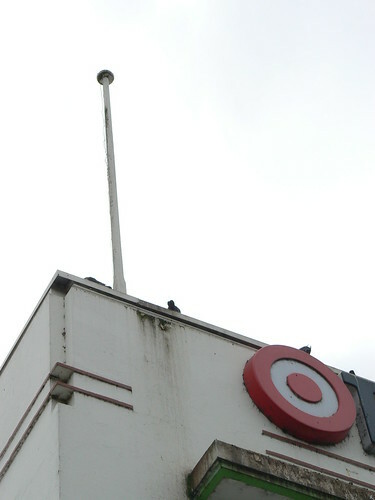 It possibly dates from the time when the building was owned by David Laidlow & Co (who also owned Millers Department Store which was next door in Gray Street). Early this century, the building was extensively damaged by fire and the subsequent rebuilding brought the unexpected benefit of exposing some the original facade that had been covered by cladding. 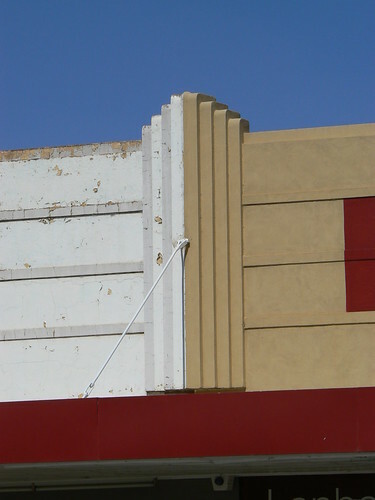 To their credit, the owners Coles Myer, restored the facade to its original appearence. 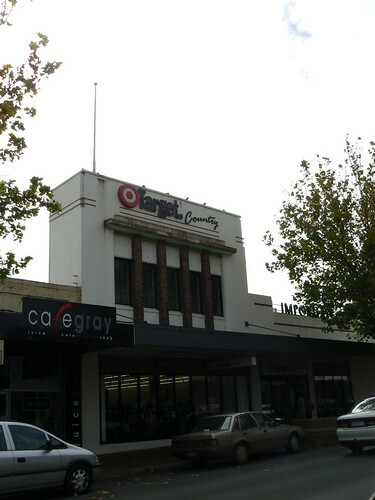 In an earlier form, G J Coles & Co, made structural alterations to the building in 1936, probably using designs by Harry Norris who worked on many Coles stores. 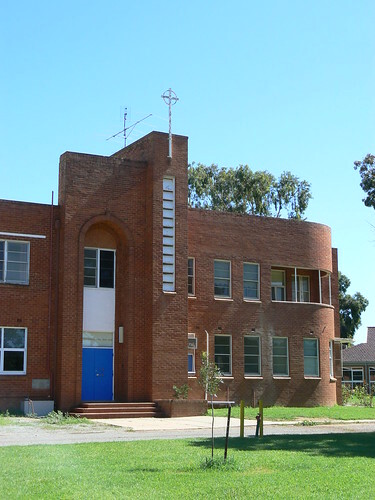 A couple of recent posts on Andrew's excellent High Riser blog (I see deco #1 & I see deco #2) prompted me to revisit my photos of Peterleigh Grove in Essendon. And while Andrew does refer to me and this blog in those posts, I have been a follower for some and often find myself lingering there jumping from item to item on his wide-ranging topics. 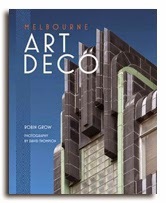 But Art Deco is my thing so back to the topic in hand. 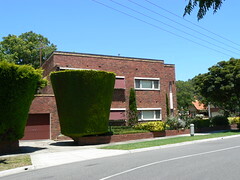 Peterleigh Grove is a magnificent residential street with most of the houses dating from 1939 and through the early years of WWII. I've featured some of the houses in the street already and you can find all the posts here and today I'm giving you a glimpse of No. Fourteen. 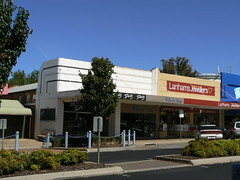 A pair of deco shops in Banna Avenue, Griffith, NSW. The Beaumont Estate in Ivanhoe was developed by A V Jennings from the 1930s. 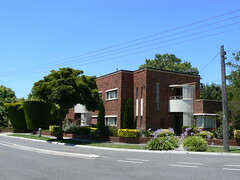 It includes a range of interwar housing styles by architect Edgar Gurney including English Domestic Revival, French Provincial and Modernist. These flats are in Melcombe Road, near the entrance to the estate. I believe they were used as the sales office when the estate was being developed. I didn't see anything else like them in the surrounding streets which have almost exclusively family homes. What about those amazing bushes (!!!) either side of the driveway. 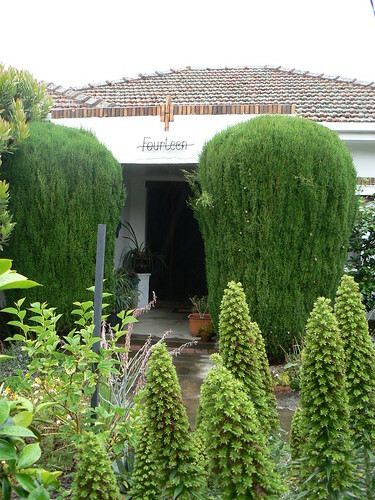 Eighty years ago they probably were small bushes but now they are fully sculptured trees although the one on the left, as we look at the driveway, seems a bit woolly at the top. Perhaps the extension lead on the electric trimmer doesn't quite reach that far. And I do like a low wall where the beauty of the building is still there for all to see after all these years. 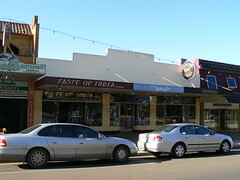 This series of shops in the main street of Leeton are the result of a 1930s makeover of an earlier building. You can see the dark brick wall of the 1918 building down the lane running alongside the nearest shop, Dee's. 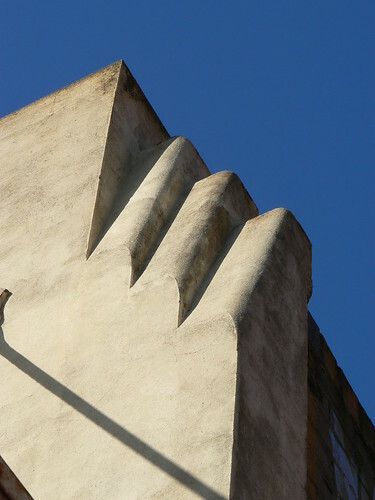 A high parapet has been added decorated with a stepped deco element in the centre and a series of three speedlines running the length of the building, turning the corner and following the curve at the end. A glimpse of a certain shade of cream coloured bricks and a flat roofline always has me wanting to stop the car for a bit of further investigation. On Yanco Avenue, on the way into Leeton, I caught sight of that certain shade of brick colour and was greeted with this substantial brick sign when the car pulled into the first available side road. It was a Saturday morning so I was able to duck into the grounds for a better look and was reward with this magnificent school. Two simple rectangular blocks perpendicular to each other joined by a curved section with a open balcony. 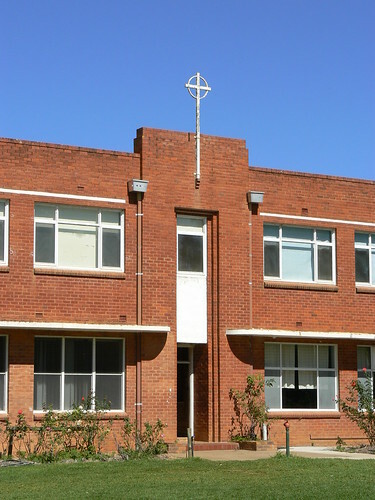 The entrances are identified by towers climbing just above the roofline. The main entrance tower taller and more elaborate than the side entrance tower. Both are topped, not quite by flagpoles, but by crosses befitting the nature of the college. The lower floor windows on this side wing are shaded by a concrete ledge, an eyebrow and I find it a bit perplexing that the upper windows have not been given similar protection. 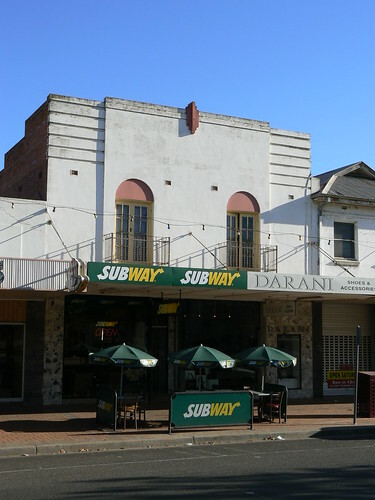 Perhaps the trajectory of the sun in this part of New South Wales makes it unnecessary yet the design of the building includes a concrete strip above the windows where the eyebrow would sit. 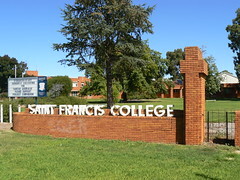 St Francis College proved to be a great welcome to Leeton and far from the only stunning building in town. 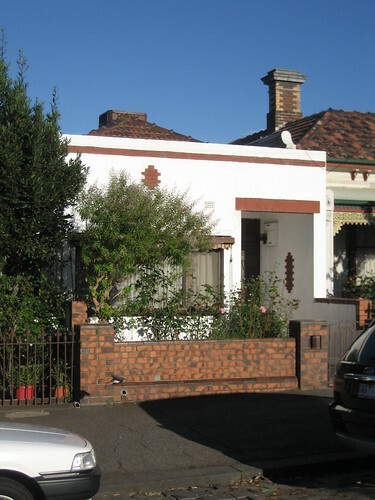 I spotted this terrace house in Canning Street, Carlton North and I like the simplicity of the decoration with the brick pattern on facade repeated, in an enlongated version, on the wall inside the porch. 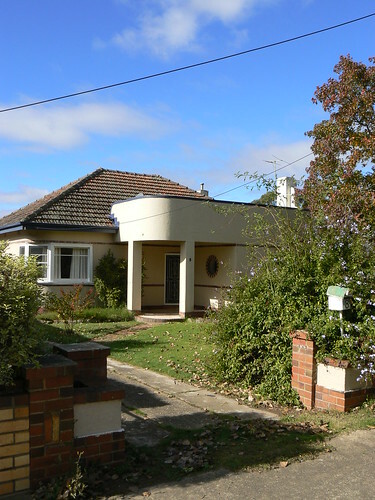 The front of the building sits closer to the footpath than its older neighbour so I wonder if it is a case of a moderne makeover of a Victorian era house. 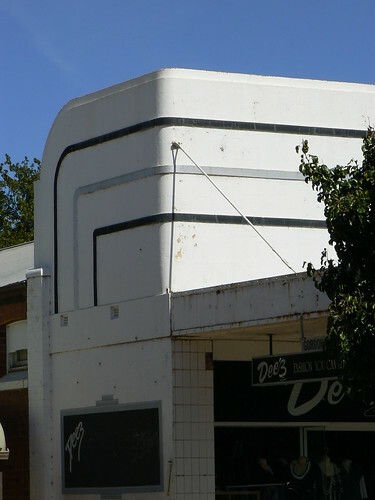 When I was in Leeton for their Art Deco Festival earlier this month I got a tip that nearby Yenda had some Art Deco buildings. 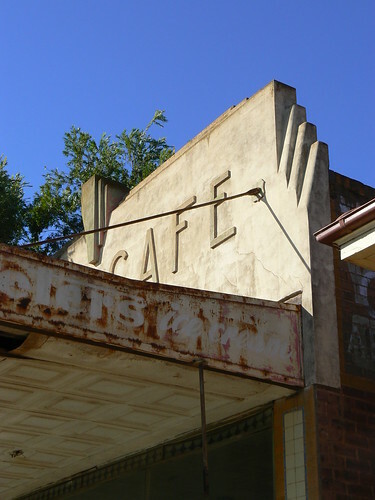 It's about a 50 minute drive from Leeton to Yenda which by Australian standards IS nearby although it is closer to Griffith which also has some nice deco and modernist buildings. I hope you can see why I really, really like the Yenda Cafe. 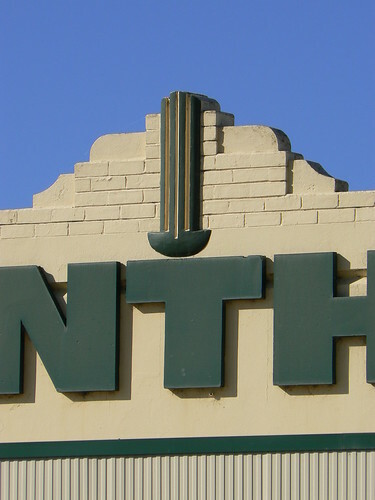 Firstly it has a classic deco element right in the centre of the slightly stepping roofline.Then there is the lettering ... full-on deco and no doubting where in the world we are. And how about those serations on the top corners. I can't describe them simply as stepping because they are so much more than that. Notice also that the metal rods that hold up the verandah are mounted on a small shield, such attention to detail. On either side of the door there are these glass display cases. 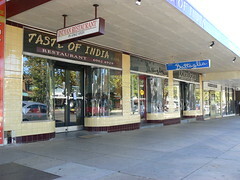 I'd just seen similar but slightly more ornate ones at a shop in Leeton. Both buildings also had the same vents below the front shop windows so perhaps there were designed or built by the same person. 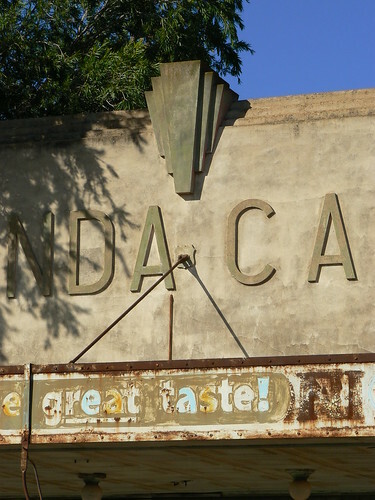 The Yenda Cafe could be a very classy venue in any city in the world so it is a real shame that it is vacant, not looking its best and perhaps with no chance of rehabilitation. Yenda is a small place and I don't know that it can support a cafe or a shop of any kind. 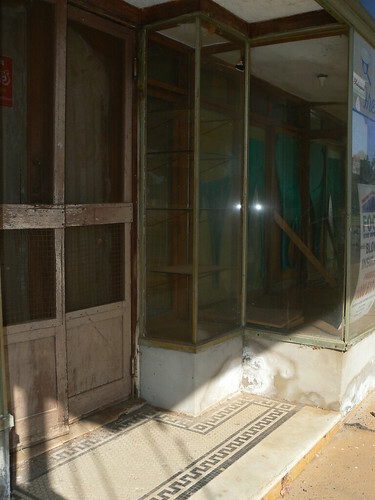 There is another vacant deco shop within 50 metres and, no joke, I only saw three people and a small dog. Perhaps everyone else was in the pub watching the footy. 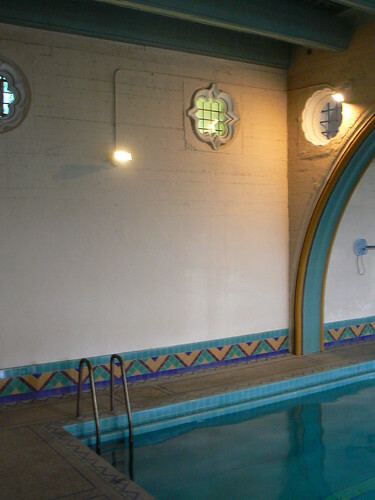 Yesterday I posted some photos of the swimming pool at the former Berkeley Women's City Club, now the Berkeley City Club, so today I decided to show you some of the other internal features of Julia Morgan's 1929 building. 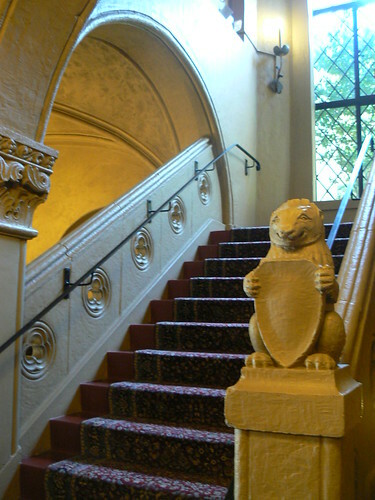 The club is somewhat castle-like with the arches, heraldic emblems on the stairs,the openings in the balustrade and the diamond pattern on the windows. 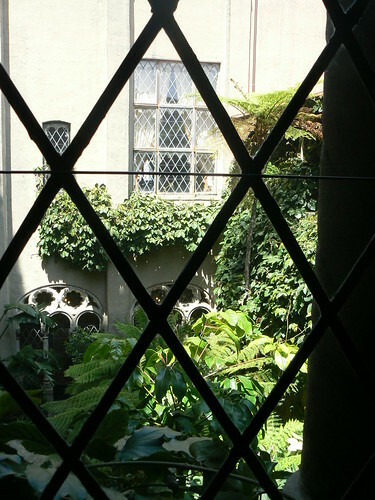 However feature of the building are the lush internal courtyards that offer a quiet place to sit and enjoy some fresh air. 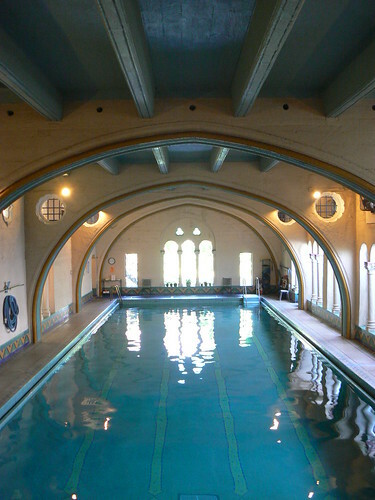 Julia Morgan designed the Berkeley Women's City Club in 1929. 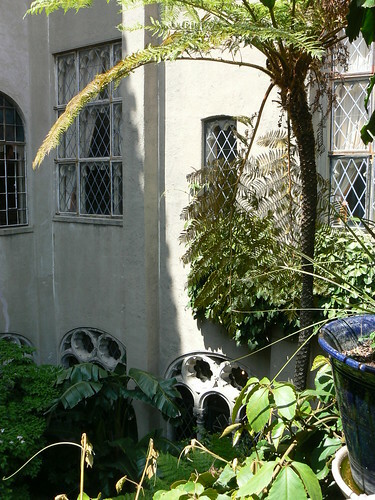 It remains a private club today however having been made avilable to both women and men since 1962, it is simply called the Berkeley City Club. One of the best feature of Morgan's building is the indoor swimming pool with its pointed arches and colourful diamond pattern tiles. 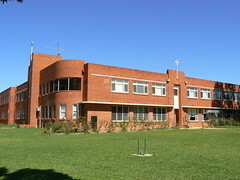 Griffith owes its existence to irrigation. 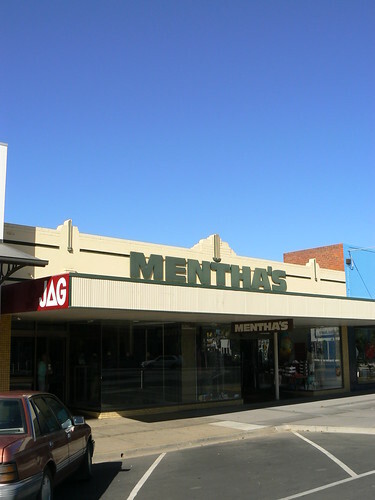 Like nearby, Leeton, the city was established as part of the Murrumbidgee Irrigation Area (MIA) in the early part of the 20th Century. 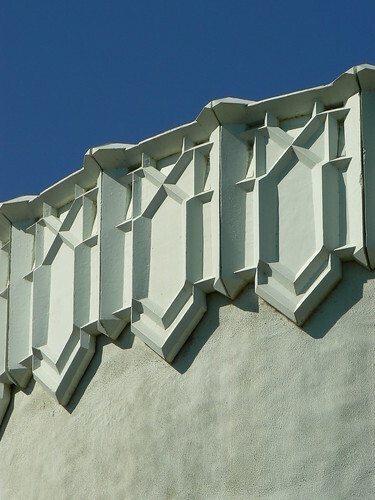 Driving down the main street my eyes were drawn to this stepped roofline. 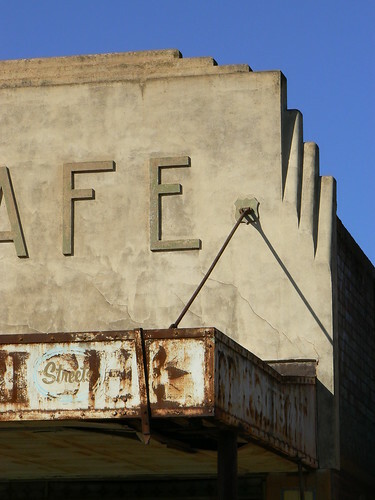 Simple, perhaps even rustic, it didn't prepare me for the view at street level. 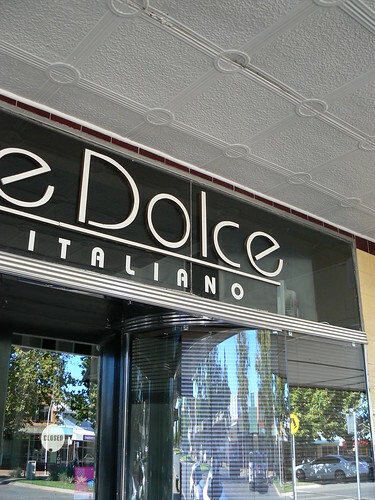 Three gorgeous shopfronts tiled in cream and burgany. Shop names standing out against a black backing and larged panes of curved glass drawing you into the doorway. 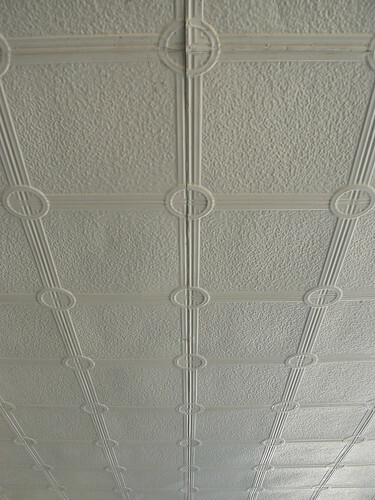 As in so many Australian shopping strips, the underneath the verandah is finished with decorated pressed tin. In this case, a simple deco pattern of lines and circles. 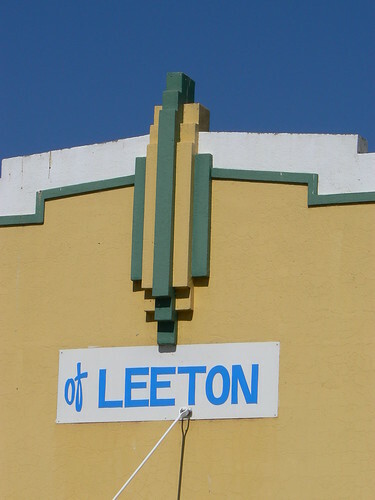 Over the weekend I visited Leeton in the Riverina region of New South Wales for their first Art Deco Festival. 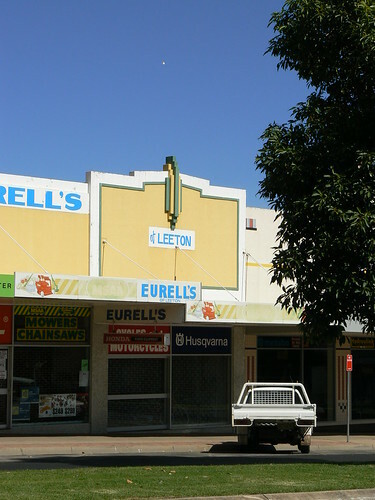 The Leeton Shire website says 'Leeton was the first town built as part of the Murrumbidgee Irrigation Area (MIA) and was designed with the assistance of noted American architect Walter Burley Griffin'. 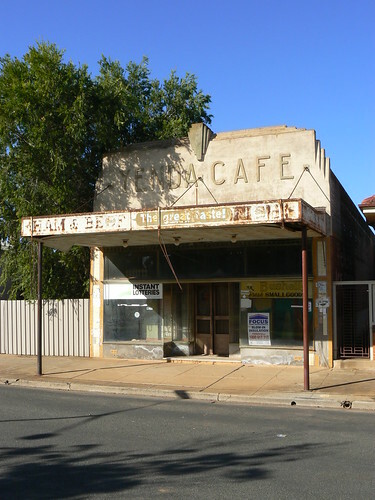 So on that basis I've taken the liberty to post something that is not really Art Deco but is strongly associated with Leeton, Griffin and water. 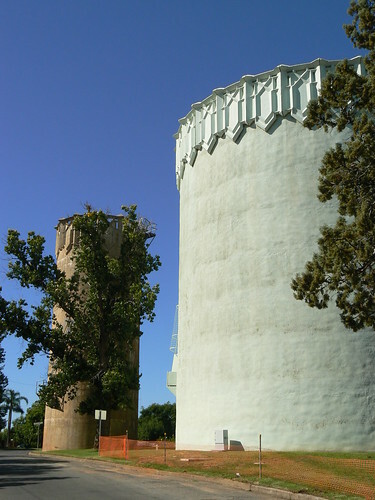 There are three water towers in the centre of Leeton (two are pictured above). 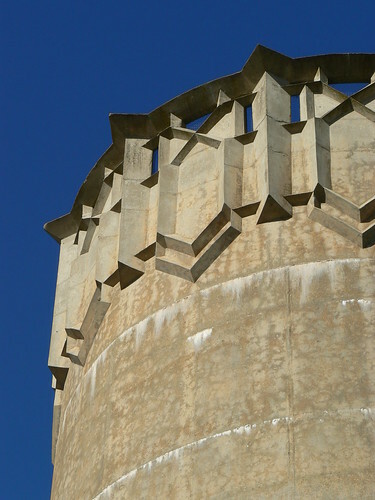 The Irrigation Commissioner's fortnightly official report published in the Sydney Morning Herald 19 December 1913, included that the water tower was 'being rapidly proceeded with'. Griffin designed included two towers in his initial design for Leeton to serve as portals to the town. Alasdair McGregor, in his book of the Griffins, Grand Obsessions, quotes Marion Mahony Griffin from her memoires recounting 'Griffin had made the drawings for the crowns of the towers on shipboard and sent them back when he landed in America'. 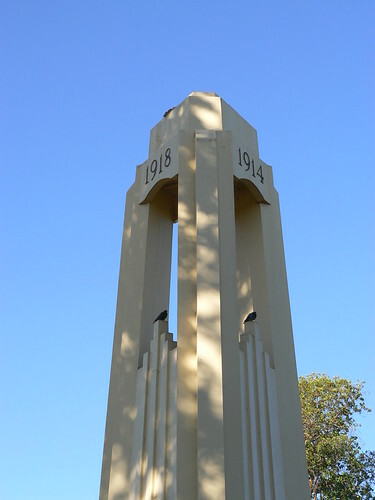 While one tower was the first Griffin designed structure built in Australia, the second tower was not completed until 1937. 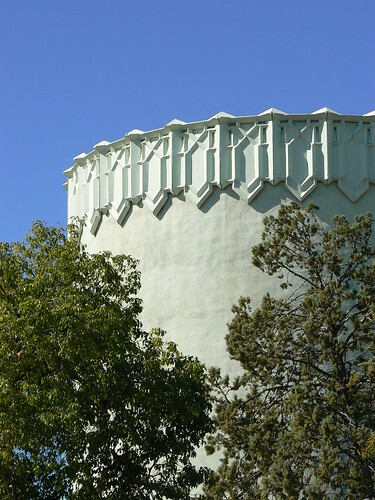 The third tower which is shorter but with a larger overall capacity, was completed in 1973. It bears a similar crown without the pierced elements of Griffin's design. 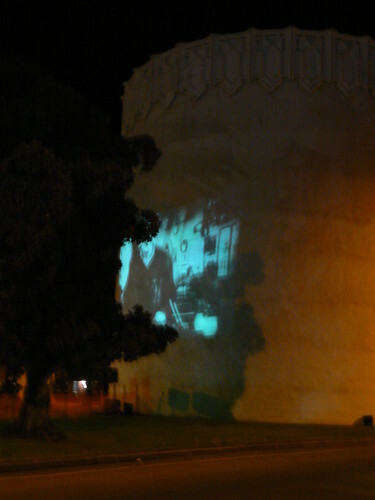 On Saturday night an outdoor cinema was created for the Art Deco Festival when Fritz Lang's Metropolis was projected onto the side of the 1973 water tower.